“What? Judas as a personality to ponder?” This remark may well be running through your mind, dear reader, and I am not surprised. On the surface, it would be akin to spend some serious time pondering over the personality of Hitler or Pol Pot. Society has almost unanimously put a “persona-non-grata” label these people in history, and has in many ways condemned them. Why should we then even consider that it would be a good thing to spend time pondering over Judas? Didn’t he betray Jesus? Wasn’t his betrayal the very thing that precipitated Jesus’ cruel and ignominious death on the Cross? An innocent man, the likes of which was never seen in history before, went to his death because of Judas. We have, even if we are not fully conscious of it, condemned him. But has the Church? Actually, the Church has never condemned him. Neither has mother Church condemned Hitler nor anyone else, no matter how nefarious they may have been. After all, condemning a person who is no longer alive means that they are damned for eternity in hell fire. But the Church has officially proclaimed many deceased persons as enjoying the beatific vision of God in heaven through the Sacred Congregation for the Causes of Saints and named them Saints in heaven. But no one has officially condemned anyone, not even Judas. It is without doubt that what Judas did was most unfortunate and lamentable. Handing over Jesus to the authorities that were just looking out for some reason to silence the Word is truly nothing exemplary or laudable. But like many other bad examples that we have in life, if we are not reflective and giving thought to, mulling over and cogitating about such acts, we may end up doing exactly the same thing (or worse) ourselves. In the same way that we can look to the paragons of righteous and holy living as the models of how we ought to live our lives, we too can sometimes look at the errors and transgressions of those whose lives had been negative examples too. From them, we learn how not to make the same wrong turns in life. 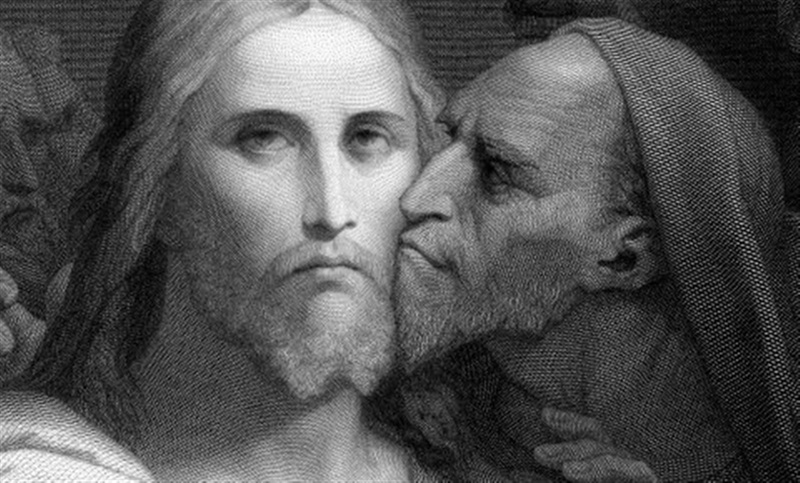 While we do not know the interior life of Judas and what went on in his heart, we do know what he did. From what he did, some conjecture can be made about what propelled him toward those actions. As much as the musical Jesus Christ Superstar was a supreme example of low Christology, its opening sequence, I believe, conveyed the motivations of Judas Iscariot. The lyrics of the song “Heaven on their minds” reveal a desire for a revolution in terms of an overthrowing of the political powers of their time, and his lament was primarily in the fact that in his opinion, Jesus was simply not making the best use of the opportunities presented to him. In short, he wanted Jesus to act according to a plan that fitted his agenda, and this led him to do what he did – hand Jesus to the authorities to make his dreams come true. Each time we find ourselves at a place in our lives where our will and God’s will are at variance, where we are, as it were, locking horns with God, we may be in a similar situation in which Judas found himself. When we face temptations, it is always a battlefront. The forces in conflict are fundamentally God’s and ours. While we want our way and things done in our time, it takes a docile heart and a tender spirit to yield and submit to plans and purposes that are not what makes us comfortable, contented and happy. It is ultimately faith that makes us yield to a higher calling and a higher purpose than those of our own, and when we fall into sin, it’s always a display that we had made the wrong choice. Selling his loyalty and friendship of Jesus for thirty silver dollars was Judas’ way of attaining his will. But scripture does reveal that he saw the folly of his ways and that he admitted that he had sinned and that he had betrayed innocent blood. He was also ‘filled with remorse’. Perhaps this is a revelation that has been overlooked too often and too long. It shows that Judas was contrite. It takes a humble person to admit of things without embellishing them with justifications and excuses. Each time a penitent steps into the confessional, this is what God sees – a humble sinner, and a contrite one, with a heart that is also similarly filled with remorse. Doesn’t scripture also say that God looks at the heart while man looks at appearances? Yes, Scripture does say that Judas went and hanged himself. He did show despair, and we often contrast the actions of Peter with his. Peter, we say, did not despair but sought the forgiveness of Jesus, whilst Judas didn’t. Who can say that if Judas had waited for the resurrection to happen that he would not, like Peter, be as effusive of his love for Jesus and leap off that boat to come before Jesus on the shore of Galilee to beg his forgiveness too? All the disciples were literally “in the same boat”, weren’t they? I am not making a case for Judas as much as I am really making a case for the mercy of God even for so-called hardened hearts and condemned souls. Suicide, like love, has its reasons only the heart knows. But unlike love, suicide is often a result of a darkness that one believes one is trapped in. We believe that Jesus went to the realm of the dead after his resurrection. We need to read that deeply to see what this means. Death for all of us is life’s final bastion, but is there a place that God’s mercy cannot reach and God’s love cannot touch? What do you think he would have said to Judas when he saw him in the realm of the dead? Thank you for this wonderful post, Father Luke. Should "after his resurrection" in the last paragraph be "before his resurrection"? I wouldn't say I wasn't surprised at your choice of Judas Iscariot as the personality in the lime-light in this week's blog - but again in retrospect- why not ? Shakespeare's Othello has his Iago as the main antagonist & Julius Caesar -his Cassius. So the Passion of Our Lord-needs a Judas . The only difference is that –the Passion is for real, not some playwright’s fantasy and literally, the world becomes the stage for this "Play". I was reflecting on your last line - "What do you think he would have said to Judas when he saw him in the realm of the dead? " Jesus needn't ask "Do you love me ?" - ( like in Peter's case) coz if Love is priceless .............how do you explain away the 30 pieces of silver? Perhaps he might ask "why don't you trust me, Judas?" And the answer will be - "coz I don't believe in you........ .....that you are the Messiah, I don't have faith." I feel that it is this lack of faith that made him kill himself. We were told in John's Gospel that Judas felt remorse for his dastardly deed. But Peter had also sinned when he denied Jesus. He was full of remorse too but he didn't commit suicide. Unlike Judas - Peter believed that Jesus is the Christ, the Annointed One of God ....the Son of God as he had openly declared. He believed in Jesus’ mission to bring salvation to all mankind. So he threw himself upon the mercy of his Saviour and Lord. He knew he had done wrong, was contrite and humble enough to let Jesus take control of his life from this point onwards. I felt that for Peter - living by the teachings of Jesus became his atonement for his sin thereafter. He wanted to live because he truly believed in God’s Love for Man (John 3:16) and also (John 3:17) – “God did not send the Son into the world to condemn the world, but that the world should be saved through Him”– though of course there were no Gospels then, for him to refer to. Judas, on the other hand, though remorseful - was still too blind to recognize Jesus for who he is - the one who loves and comes to forgive. Perhaps this thought seemed so incongruous to his own idea of a conquering Messiah – that he would not entertain it at all! I’m sure he was angry, dis-illusioned, disappointed and irritated with himself and with Jesus. So, though (as you said) Jesus did not condemn him, he condemned himself to a darkened cell of despair and hopelessness. These ‘demons’ clouded his mind and prevented him from experiencing God's spirit of peace, consolation, forgiveness & tenderness – perhaps, this is the "docility to the Spirit" that is necessary for one’s heart to experience the touch of God.